Justin Higner started making model ships at the age of ten and never stopped. Now twenty-five years later he has an amazing collection of cardboard crafts. They range in style and in sizes. Some of the ships are small and can be easily handled and some like the artist's "Leviathan" which is fourteen feet long are credibly impresive in their detail. 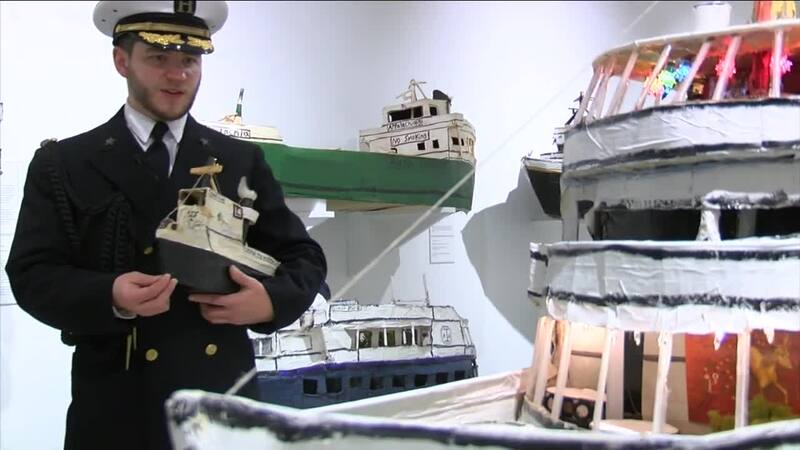 He may have begun as a hobbyist, but now that forty of Justin's ships are on display at the Castellani Art Museum, the hobbyist has evolved into an artist. Justin's collection fills an entire room and while he gives the tour he likes to dress as the "Commodore" of his fleet. He says he got hooked on building ships because the represent limitless possibilities, adding "they carry people, they carry ideas, they carry senses of self for whole cultures." Justin's collection will be on display at the Castellani Art Museum through March 17th. You can check their website for more info. LEWISTON, N.Y (WKBW-TV) — Justin Higner started making model ships at the age of ten and never stopped. Now twenty-five years later he has an amazing collection of cardboard crafts. They range in style and in sizes. Some of the ships are small and can be easily handled. Some of the pieces, like the artist's "Leviathan" is fourteen feet long are credibly impressive in their detail. He may have begun as a hobbyist, but now that forty of Justin's ships are on display at the Castellani Art Museum, the hobbyist has evolved into an artist. Justin's collection fills an entire room and while he gives the tour he likes to dress as the "Commodore" of his fleet. He says he got hooked on building ships because they represent limitless possibilities, adding "they carry people, they carry ideas, they carry senses of self for whole cultures." Justin's collection will be on display at the Castellani Art Museum through March 17th. You can check their website for more info.